Apple iBooks has just received an update. It’s now at v1.5, adding night time reading theme, new fonts, full screen more and more. – Nighttime reading theme makes reading books in the dark easier on the eyes. – Full-screen layout lets you focus on the words without distraction. 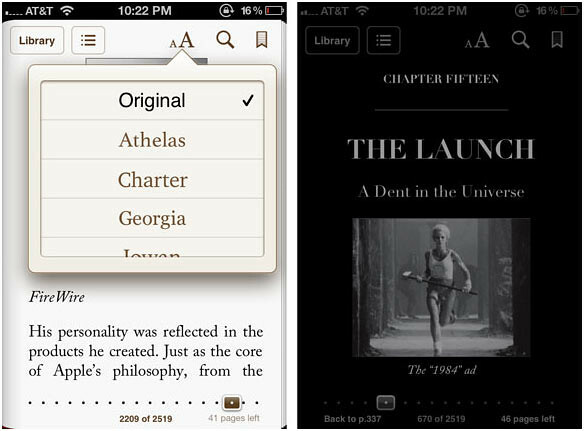 – iBooks now features an improved selection of fonts, including Athelas, Charter, Iowan, and Seravek. – Beautiful new classic covers for public domain books. – Support for pop-up footnotes, included in select iBookstore titles. – A redesigned annotation palette makes it easier to choose a color for your highlighted text.